Peel and cube potatoes. Heat up a pan with one tablespoon of olive oil. Add potatoes and cook for 15 minutes flipping every 5 minutes. 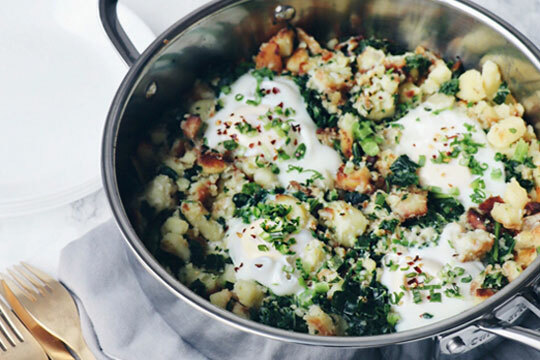 Once potatoes are soft, add salt, pepper and greens, mix well and then crack 4 eggs into the pan (leave eggs whole). Cover and cook for 4-5 minutes or until eggs are set. Top with diced green onions and enjoy!